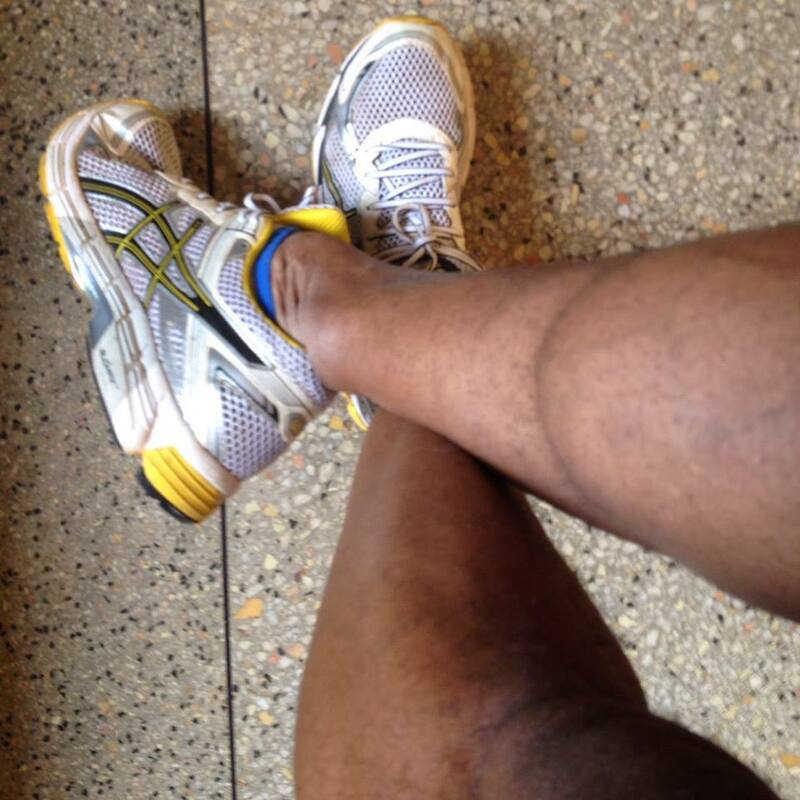 Urban Swaras running club is running to fund raise for one of its members, Kevin Mwachiro. Kevin was diagnosed with cancer, multiple myloma to be precise. We kindly ask that you donate a minimum of KES 100 per km. You run towards the cause of Kevin’s treatment. If you feel you have it in you to donate more than the minimum per kilometre, please do so as well. Ask your friends and family to join us, and let them also contribute towards the cause. If they don’t want to run, let them match your donation. Do what you can, and in the process burn some calories ….. and feel good for having done your part. For Payments please Mpesa to 0706238824. Please indicate that it is for Swara Kevin. As August comes to a close I remember that September was the month when we got the name Urban Swaras. I feel like we have to have a birthday party because I do love parties. Today I will risk sounding like Babyface in the song ‘simple days’. Before we became Swaras we were something else. Many may not know how we came together but it was very simple. In those days few people ran. During a morning run you would only meet one person running. We were few recreational runners. Our coming together was a mere coincidence. Ajaa, Nduku and Ivy seem to have been running together. From the history books, I got to know that Nduku and Ajaa met Ivy in the Catherine Ndereba road race in Nyeri. Mercy, Nadine, Lucy and I were running together. We had a trainer named Zablon who almost died in Lewa, he quit. Lucy had a friend called Masese and he was running with a few other people in Ngong. 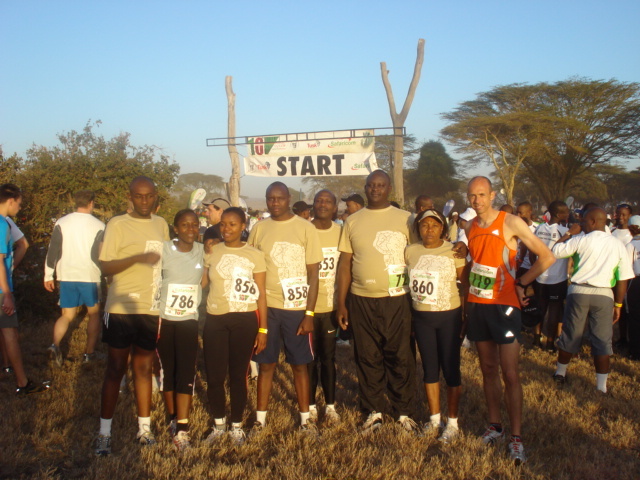 One day they invited us to run in Ngong. 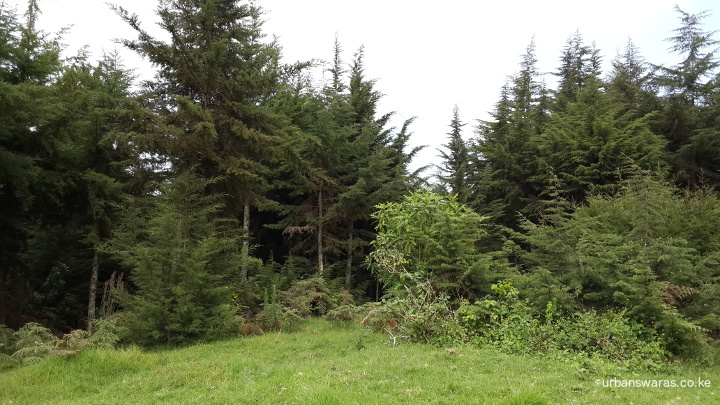 We were late and did not find them but after 20 minutes of running up the hills, we thought this was too hard and came back to Nairobi. Lewa of 2008 was the next weekend. 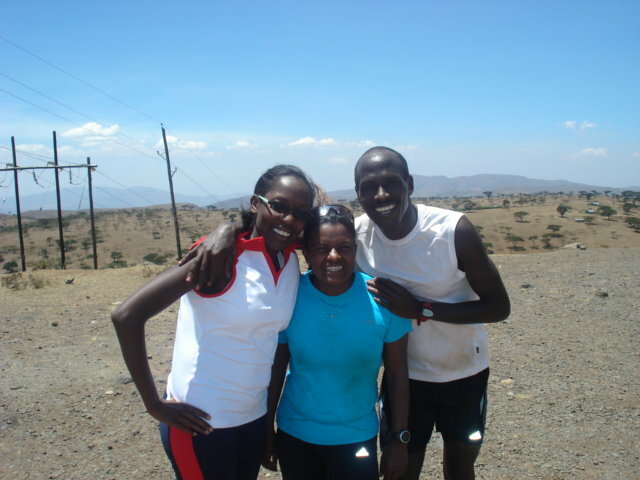 Nadine and I loved running in the Arboretum and this is where we met Wanjohi who in turn introduced us to Ajaa. At least we had a CV to our names as we were introduced as the girls who are going to do the Kigali peace marathon. 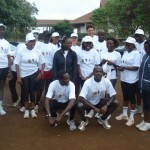 The invite for running in Ngong came again from Wanjohi. This time round we went and met the other group. We formed a happy running group. We were not more than 10 people. We decided to have a secretary and I took up the role. I did not like the name secretary and so I chose to be called the madam coordinator. The mailing list then had no more that 10 names. Our default running ground was Ngong. We went there every Saturday. We knew all the hills. We gave them names according to the incidences that happened. There was the ‘Nadine hill’ and the ‘tantrum route’. We also had the hardest of the runs named ‘hydrate or die’. This one would get you on all your fours at some part. After all runs we took tea in a café in Ngong town. Our route marker was called ‘Antelope’. He was fast. The distances were never really accurate. But we did not mind. We did not have gadgets that measured distance. We just ran the routes as we already knew the distances from the elites. Magadi road to Police station was 42Kms. Measuring time was enough. Antelope always told us that ‘it was training and not a race’. I think he knew how harsh Ngong was. 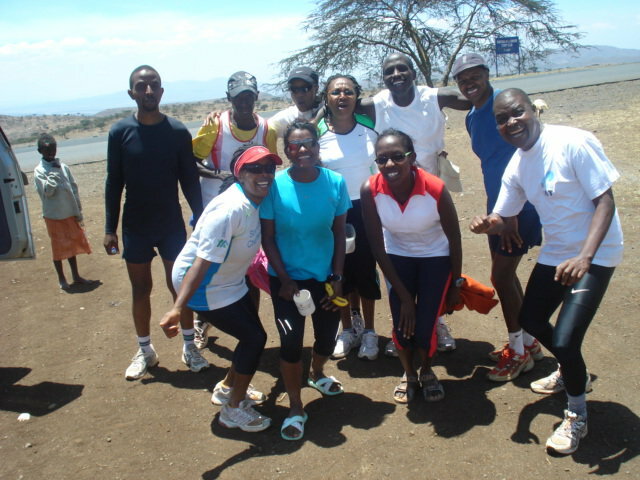 Nadine, Mutua, Ajaa and I trained for the Standchart marathon in Ngong every Saturday. We would reach a point where only the sound of our feet could be heard. 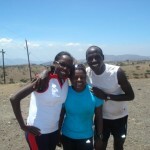 Every Wednesday the twins, Mutua, Nadine and I got together to do our mid-week run of 20Kms. It was a fast run. All we did was chase the boys. For as long as we could see their back, all was well. Hope that you are all keeping well. This weekend the run is at Ngong. 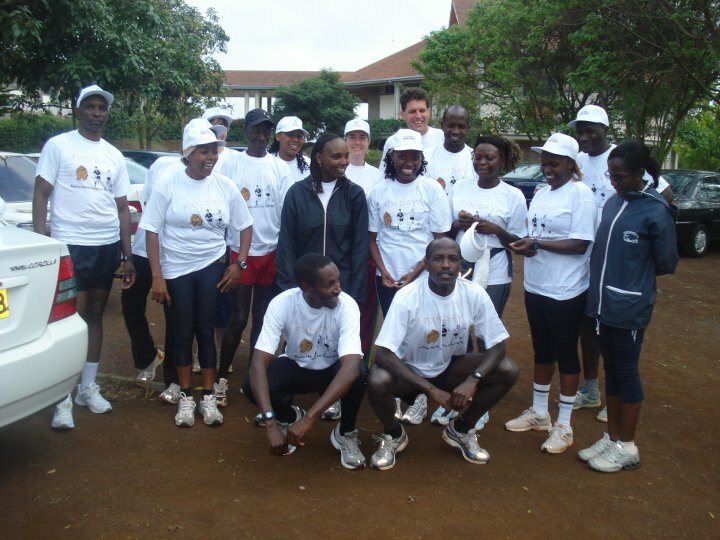 We meet at Ngong Police station at 7.15 to begin running at 7.30am. Our invite to Tigoni came from Mukuria and his lawyer friend. We met this duo at the Arboretum and invited them to run with us. They came and in turn invited us to run with them. When we went to Tigoni, we behaved like guests. We agreed to run alongside our hosts but this was not to be. Soon after the run began Ajaa and Mutua took off and asked me to take care of the guests. Within 30 minutes I had also left the guests and dashed off. We enjoyed Tigoni so much it became a part of our Saturday running routes. As the years went by we grew in number. We had a big mailing list of about 30 people and we got to have the same faces come again and again. I remember Marcel, Wahome, Loise, Shiku, Wachira, John Juu, Katwa, Lena, Kanyarati, Kibet, Fran, Molly, Loketo, Ameet as the commoners. Kibet was our ‘elite’. He once got airlifted with a chopper from Lewa. It reminded us that we needed to continue training. The Cameroonians joined us. Eric Sile became a regular and invited his countrymen who have continued to run with us. The Australians and the British came and left. Now we have the Swedes and Indians too. It was in 2010 that we got registered officially. As I left Kenya for further studies, I handed over the baton to Lucy. There was a suggestion that we need to have a name and the name search was floated to the member. Upin who has since disappeared, suggested the name Urban Swaras. He explained that we were fast and running in the city thus the name. We quickly adopted it and our webmaster Munyao designed a logo for us. Indeed we have grown. Members have come and left. We have invited our friends to run. Some came and stayed and others rejected us. Some fell along the way and never came back. But it has mostly been exciting. We have become a diverse group. And as we get into the month of September, we will be 7 years if we count from when we started operating as a group. Officially we shall be 4 years. Let’s celebrate us. The drive to Lari was as interesting as the run. We were to be there at 7am as usual but of course this did not happen. The place was further than most of us thought. An accident on Waiyaki way did not make the 6.15am jam interesting and the fog at the view point / Lari area was an indication that this was going to be a very challenging run. The Swaras gathered together and one of the open car boots became an umbrella. I am not sure if that was mist or it was rain. All I know is that it was wet. Some of us came in scarfs and some were busy jumping up and down as elite runners would. This was not the normal kind of run where Swaras take off at the blow of a whistle. We had to get a briefing from the Kereita forest representative. I am not sure what he said but it must have been important because I already knew that we were to enter the forest in a group due to the presence of elephants. The beginning of the run to the gate entrance of the forest was steep and the altitude was high. It kept going up up up and up. After about 4.5Kms we arrived at the gate entrance. For the first time I witnessed camaraderie among the Swaras. We had to wait for everybody. You see, in most runs it is everyone for themselves and those around them and God for us all. But this time round there were elephants in the forest. So we were to run in a pack in the forest. I wonder how many Swaras remembered. The forest was beautiful. Running through this forest was nothing but bliss. It was the change of terrain that made it fantastic. There was a part where it was all grass and the feet just felt like running on a thick carpet. It was raining and the sound of the rain drops falling from the leaves was calming. I am not sure if it was raining or it was just foggy but it was beautiful. The trees were tall and made us look really small. For those running close by me we took a detour. I had to show them the elephant that was gunned down by poachers last August. It was a sad moment seeing the carcass again. We continued and the elephants were forgotten but occasional fresh elephant dung was a reminder that we were not out of danger. We raced out of the forest. The villagers came out. We greeted them as we passed. The children waved in excitement. I think there was one who was counting us. We all had numbers. Next was the climb that began on the tea zone. The landscape was beautiful. Different shades of green together. The tea looking like a green carpet was breath taking. I had to continuously marvel at the beauty of this place. It was climb climb and climb. My target was 15Kms. 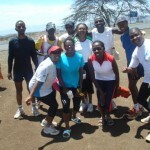 At the end of 18Kms, Mutua and I said we had done enough. We jumped onto a motorbike and headed home (base, start point). The base was cold. Lyma’s advice to carry warm clothes was very handy. Each Swara landed with a story. The one that made me laugh the most was Wachira breaking every time he saw a hill. He even admired the fences of the homes and the beautiful flowers. The thing is he set off to do 21Kms and ended up doing 27Kms. Everyone had their story, but what we know is that we are sure going back to the Lari Lucy Kereita run.